The name, Geovanni Franco, registers as Italian. The birthplace listed in the Del Mar jockey roster says Mexico City. The word Franco received recently from a family sage took him to yet another place. What Franco, 27, was doing Wednesday morning – exercising horses and preparing to ride four races in the afternoon – was the same thing he did Sunday morning. And his appearance on Sunday was as surprising as the young jockey's family heritage to those who had seen the spill to which he was a party in Saturday's 10th race. Franco and Corey Nakatani were both unseated and thrown to the turf. Franco came out of it with a bruised foot and was able to ride workouts the next morning and win Sunday's ninth race on Johnny Strong ($39.80) for trainer Gary Stute. Nakatani incurred a back injury that will require surgery and will sideline him for several months. “You ever been on a roller coaster? You get to the highest point, you know you're going down and there's nothing you can do about it. That's what I remember,” Franco said. “You hope for the best and thank God we came out of it OK.
Franco does not hail from a racing family, but had two uncles who worked at a track in Mexico City. One was a groom, the other a farrier. The farrier, as the story goes, suggested to nephew Geovanni that he shouldn't be under the horses, but on top riding them. That's where Franco has been, professionally, since 2009. He won his first race in March of that year at Mexico City's Hipodromo de las Americas and soon moved his tack north of the border. He was the leading rider at Turf Paradise in Arizona in 2013, with his current agent James Giannone booking mounts. Franco and Giannone parted company for two years but were reunited in 2015 and worked at Midwestern tracks – Fair Grounds in New Orleans, Remington Park in Oklahoma and Canterbury Park in Minnesota. To that point, Franco hadn't seen the movie. He made a point to see it and, of course, liked it. Equibase statistics through Sunday show a steady annual increase in earnings for Franco with 2018 being a record with nearly a half-year still to go. Franco has 64 wins from 424 starts in 2018 and earnings of $3,130,462. His career totals are 3,869 mounts, 721 wins and $14,013,642. Franco won the 2017 Oaklawn Handicap on Inside Straight and came to California to ride here for the first time last summer. He was only out west a few months when he had to submit to surgery for an old injury. 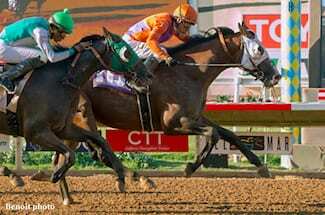 However, he made an impact early this year riding Fault for Phil D'Amato to victories in the Grade I Santa Monica, Grade II Buena Vista and Grade III Adoration at Santa Anita before she was retired with an injury to start a career as a broodmare. Through Sunday, Franco had nine wins from 63 mounts at Del Mar, tied for fifth with apprentice Heriberto Figueroa in the rider standings.